Here is a substantial reading list of books which relate to Glamorgan, either county or parish. You can also perform a more selective search for churches in the Llangiwg area or see them printed on a map. Rees, Thomas & Thomas, John. Hanes Eglwysi Annibynnol Cymru. (History of the Welsh Independent Churches), 4 volumes 1871+. The church is dedicated to St. Ciwg, is in the Benefice of Llangiwg (Pontardawe), and Diocese of Swansea and Brecon. Details of the present incumbent of this benefice can be found at the Church in Wales website. The church can be located at grid reference SN723056. Llangiwg Ecclesiastical Parish Records "Registers (including service and banns registers) 1703-1988; licences 1859-1868; Churchwardens' accounts and correspondence 1882-1942; papers relating to church buildings 1887-1954; Vestry minutes 1773-1815; Highway rates 1859; papers relating to church school 1856-1947; church histories 1963 and c. 2001"
"Dedicated to St Ciwg. Ancient parish, out of which was created the parish of Ystalyfera in 1911. Includes St Peter's, Pontardawe (built 1858-1862 by William Parsons, and consecrated 1862) and St Mary's, Ynysmeudwy (built 1913, sponsored originally by Mrs Illtyd Thomas of Glanmor, Swansea, and finished by her daughter, Mrs F. W. Gilbertson). All Saints, Pontardawe, originally built by Arthur Gilbertson in memory of his father William as a chapel of ease in the parish of St John, Clydach in 1886, was transferred to Llangiwg parish in 1903"
Description of parish from A Topographical Dictionary of Wales (1833) by Samuel Lewis. Transcript of complete name listing for Llangiwg, from Slaters Directory for 1871. Kelly's Directory South Wales 1910 The data extracted relates to the villages of Lower Brynamman, Cwmgors, Gwauncaegurwen, and Rhydyfro and Llanguicke parish in general with the exception of Pontardawe and Ystalyfera which have their own sections on the CD . Jones, Bill & Dr Huw Walters. On the American Frontiers: Amman Valley Emigrants in Texas, 1879-1880. The Carmarthenshire Antiquary, 37/2001. The transcription of the section for Llangiwg from The National Gazetteer (1868) provided by Colin Hinson. Ask for a calculation of the distance from Llangiwg to another place. You can see the administrative areas in which Llangiwg has been placed at times in the past. Select one to see a link to a map of that particular area. W D Williams collection "Lecture notes, 1923 including notes for a lecture concerning the history of Ystalyfera 1923, notes for a lecture on the old industries of Ystalyfera undated (?1920s) notes for a lecture on the history of the Parish of Llangiwg undated (?1920s) and a notebook recording the contents of other copybooks and notebooks undated (?1920s"
Davies, John Henry. The History of Pontardawe and District , 1967. Index by Gareth Hicks. This book has a wide coverage of the parish and outside its borders. Thomas, Hugh. THE INDUSTRIALIZATION OF A GLAMORGAN PARISH (Llangiwg). National Library of Wales journal Winter, 1975, Vol XIX/2 . pp 194-208. A complete extract of the first of three articles. Thomas, Hugh. THE INDUSTRIALIZATION OF A GLAMORGAN PARISH (Llangiwg). National Library of Wales journal Summer,1976, Volume XIX/3. pp 227-242. A complete extract of the second of three articles. Thomas, Hugh. THE INDUSTRIALIZATION OF A GLAMORGAN PARISH (Llangiwg). National Library of Wales journal Winter,1976, Volume XIX/4. pp 345-361. A complete extract of the final of three articles. Cilybebyll estate papers 1497-1954 "The Cilybebyll estate was small and compact, made up for the most part of lands in the southern and central parts of the parish of Cilybebyll and neighbouring parts of Blaenhonddan to the west of Alltwen, and farms near Pontardawe in the parishes of Llangiwg and Llangyfelach. The estate also owned Cwmtwrch Farm in Carmarthenshire, near the foot of the Black Mountain. Whereas some estates could boast continuous ownership by one family over several centuries, tenure of the Cilybebyll estate was rather more complicated................................."
In February 2008 the 300th issue of the 'Llais' - the Swansea Valley Welsh language monthly newspaper- will be printed. This will be the 30th year of its existence and since it's inception monthly copies have been lodged at the National Library of Wales Aberystwyth as have all other 'papurau bro' (local area publications) produced throughout Wales. The paper is a non commercial publication, run by local volunteers, and is distributed locally by hand and by post to various subscribers world wide. 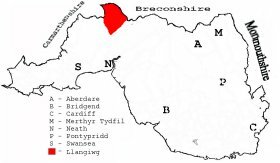 The area covered by the publication includes all the Swansea Valley villages from Penycae and Cwmllynfell in the north to Clydach and Graigcefnparc as well as Rhos and Rhydyfro. Relevant information and photographs is collected by and submitted by individual volunteers in every village. Schools and other organisations also provide information and the organisers are always pleased to receive any new submissions from any source. The Llais organisation, as part of its 30th anniversary celebrations, will be producing a Calendar for 2008 which will include old photographs of the region. A meeting of farmers has been held at Cwm Twrch ............ between 500 and 1000 farmers and others with Mr John Jones of Bryn Amman elected to the chair......... called with a view to try and discover the causes from which so much distress pervaded the whole county, why it was that so many of the people found it so difficult to obtain a living. Speakers included; Mr B Allen, farmer;Mr Williams, farmer; Mr H Herbert, farmer. The main points at issue were; tithes - paying one sixth against the one tenth they 'ought to pay, blamed the Commutation Act. Also rents were raised because they competed against each other when farms came up for rent. Also the restrictions on imports which brought about higher rents and kept the price of land high. Also the 'infamous poor laws which were most unnatural' leading to higher rates on the farmers with too much going to 'management expenses'. They wished 'these laws to be abolished, and corn laws also' - A petition to the Queen was ultimately agreed, embodying the above sentiments. The Population of Llangiwg was as follows, and a more detailed breakdown is available. Llangiwg Parish Council and Pontardawe Community Council Records " ....... including minute books, 1894-1897; poor rate books, 1849-1914; vestry minutes, 1855-1887; tithe plan and apportionment, 1842; Pontardawe Community Council videos, 1995"
Gwrhyd School (closed in 1906) "Log book, 1890-1906, of Gwrhyd School"
Rhydyfro elementary school (opened in 1877) " ..... comprising log book (mixed and infants), 1877-1931; admission register, 1877-1911; centenary booklet, 1977"
Walters, Huw. Cynnwrf Canrif : Agweddau Ar Ddiwylliant Gwern. Cyhoeddiadau Barddas, Abertawe, 2004. ISBN: 1900437678. Paperback, 372p. Extract from the article re Ebenezer Independent Chapel, Swansea taken from Hanes Eglwysi Annibynnol Cymru. By Thomas Rees and John Thomas; published in 1871+.